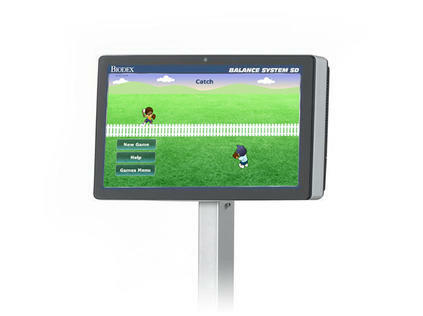 Upgrade your Balance System™ SD or BioSway™ software with Balance Games. Available for devices with a 15.6" display only. Before downloading the game software, make sure you have previously downloaded the most current software for the Balance System SD or BioSway. Click links below to update software now. Note: We recommend downloading files using Chrome or Firefox. Internet Explorer may require an extra step. Please follow instructions provided with each link for a successful download. Use gravity to move a ball through the maze while training degree of sway. As patient’s weight shifts on the platform, the 3D maze tilts in the same direction. Move the avatar with weight shifts to catch the digital ball. Patients train with random throws, or in a pattern to enhance motor control. Reduce fall risk with dual tasking that challenges motor and cognitive function to improve gross motor performance. Highlight hidden words on the screen by shifting weight on the platform.